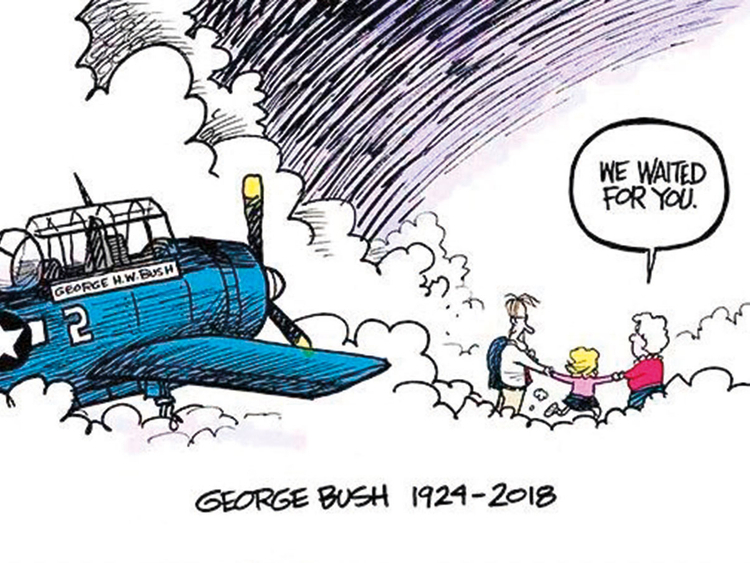 Marshall Ramsey was awakened by his wife late last Friday night with the news: President George HW Bush had just died. Right away, Ramsey thought back to his idea. When former first lady Barbara Bush died in April, Ramsey, the editorial cartoonist for the Mississippi Clarion Ledger, created a memorial illustration that went viral. Days later, when her husband of 73 years became ill, Ramsey began thinking about a companion cartoon as trbiute to Bush. “But he’s tough as nails and bounced back,” Ramsey said. “So I just filed the idea away.” Until Friday night, when Ramsey learned that the 41st president had died at age 94. “I drew it as quickly as I could and then posted” it on social media, Ramsey says of the tribute. Ramsey said he also got an email from a mother who shared her conversation with her dying five-year-old about them reuniting in heaven. “Honestly, that moved me to tears,” he said.